Will Mark Consuelos Guest Cohost on "Live!"? 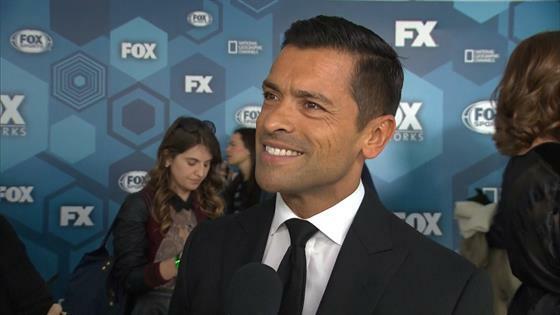 Mark Consuelos has quite a bit on his plate right now with his new Fox show starting soon, but will he find time to guest host beside Kelly Ripa on Live! now that Michael Strahan has left? The 46-year-old chatted with E! News a bit at the Upfronts in New York this week, and though he was quick to dodge any more questions regarding the show, he did answer whether we can expect to see him sitting beside Kelly sometime soon. "I think a couple times," he responded, short and sweet. One thing he wasn't short on discussing, however, is his new TV show, Pitch, which he describes as "inspiring, motivating, transcendent." "The show that I did made it through a long list of hurdles," he explains (a comment we couldn't help but relate to his wife's current situation on Live!). "It's about the first female baseball pitcher in the major leagues. I watched the pilot today. I think it's fantastic! It's very inspirational." He continued, "I think the message is that certain things shouldn't stop you from achieving your dreams. That's very, very true and representative in this pilot." The pitcher, Ginny Baker, will be played by Kylie Bunbury, and Mark will play the General Manager of the baseball team who calls her up to play.